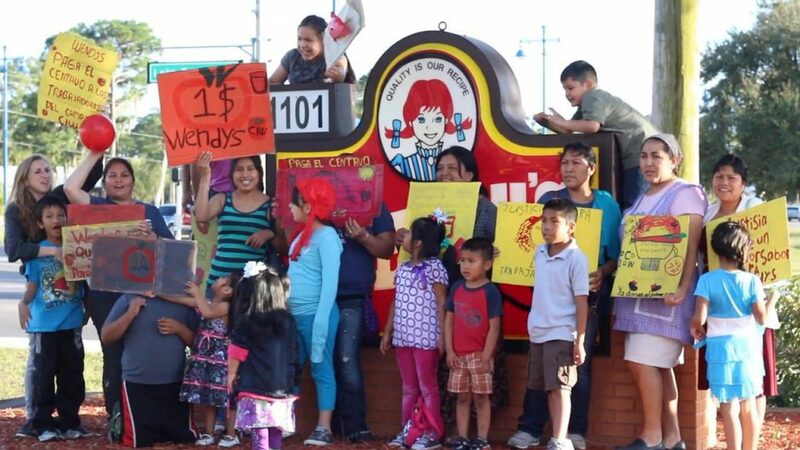 As part of today’s Food Week action, support farmworkers by delivering a manager’s letter to a Wendy’s near you. As a Wendy’s consumer and supporter of the Coalition of Immokalee Workers’ (CIW) groundbreaking Fair Food Program, I urge Wendy’s to join with the CIW and the Florida tomato industry as they work to eliminate the forced labor, poverty wages and other human rights abuses historically faced by Florida farmworkers who harvest your tomatoes. • Stagnant, sub-poverty wages: Florida tomato harvesters are still paid by the piece. The prevailing piece rate today is 50 cents for every 32-lbs of tomatoes a worker picks, a rate that has remained virtually unchanged since 1980. As a result of that stagnation, a worker today must pick nearly 2.5 tons of tomatoes to earn minimum wage in a typical 10-hour workday. Most farmworkers today earn less than $12,000 a year. • Absence of fundamental labor rights: Florida farmworkers have no right to overtime pay, no benefits and no right to organize in order to improve these conditions. • Modern-day slavery: In the most extreme cases, workers have been forced to labor against their will through the use or threat of physical violence. The good news is that a new day has dawned in the fields. The Fair Food Program, an historic partnership among farmworkers, tomato growers, and eleven leading food corporations is building a new tomato industry that advances the human rights and dignity of farmworkers while strengthening the sustainability of the entire industry. By joining the Fair Food Program, corporations require more humane working conditions from their Florida tomato suppliers, pay a small premium to help support those improved conditions, and commit to purchase exclusively from growers who meet the Program’s higher standards. These commitments are monitored and audited by the Fair Food Standards Council, a nonprofit third party organization, to ensure accountability and transparency. Of the five largest fast food corporations in the country — McDonald’s, Subway, Burger King, Taco Bell (Yum! Brands), and Wendy’s — Wendy’s is the only one not participating in the Fair Food Program. Sustainable restaurant leader Chipotle Mexican Grill also participates. The truth is, whatever premium Wendy’s may be paying is not the Fair Food Premium, it is not being monitored by the Fair Foods Standards Council, and it is not going to address farmworkers’ grinding poverty. Wendy’s statement that its suppliers belong to the Fair Food Program is both unverifiable and meaningless because Wendy’s, unlike its competitors in the Fair Food Program, does not have to, and does not, tell anyone who its tomato suppliers are. Nor does Wendy’s have to suspend its purchases from any participating grower found out of compliance with the Fair Food Code of Conduct. These are the dual linchpins that give the Program its teeth, and Wendy’s simply is not doing its part. The Fair Food Program is a proven model, recognized by both the White House and the United Nations, that offers Wendy’s a tremendous opportunity to become, without incurring any competitive disadvantage, part of the human rights advances in Florida’s fields. As a Wendy’s consumer, I look forward to your company working with the CIW and with Florida’s tomato growers through the Fair Food Program to ensure human rights for Florida farmworkers who harvest the tomatoes used in your restaurants. For more information, please contact the CIW at 239-657-8311 or workers@ciw-online.org. You can download, a copy of this letter to print and mail HERE.